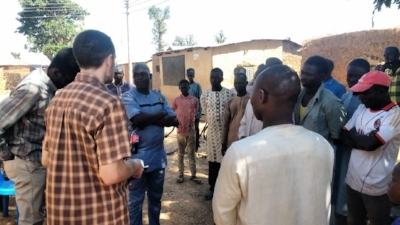 Interview with Babban Gona farmers in Kaduna state, Nigeria. Smallholder farmers represent a majority of Nigeria’s labor force and produce a major contribution to the national agricultural output and GDP. However, they remain poor, primarily due to lack of economies of scale driven by low cash flow and limited access to credit. Founded in 2010, Babban Gona aims to solve the constraints to success for smallholders by franchising farmer groups. It provides these groups with a package of inputs, technology and services to optimize yields, labor productivity, and produce quality while improving market access. The program plans to continue ambitious expansion on the path its stated mission to reach 1 million farmers by 2025. IDinsight’s work has two channels to impact. The first is to generate operational recommendations and insights trigger improvements to the Babban Gona program that increase its impact on program farmers. The second is to generate evidence on the program’s impact, helping to leverage funding to expand the program and bring its impact to more farmers. IDinsight provides various services to Babban Gona, beginning with a Theory of Change exercise concluded in late 2018, and continuing with a Process Evaluation in early 2019, an Impact Evaluation with endline in mid-2020, and potential design of an internal impact measurement system using satellite data. The multi-service nature of the engagement is designed for the diverse needs of the client and the high potential for impact through IDinsight’s work.